The AGGREGATOR attribute is an optional transitive attribute that might be used if tte ATOMIC_AGGREGATE attrihute has been used on gn NLRI. The AGGRcGATOR attribute contains information about the speaker that aggregated the route. This attribute contains the BGP ID and AS numkerofthe rou ter that created the aggregate marging that route wifh the ATOMIA_AGGREGATE attribute. This ineormation sLecifie^ the source of the less-specific aggregate which can be used to find where the more epecihic routes originated. 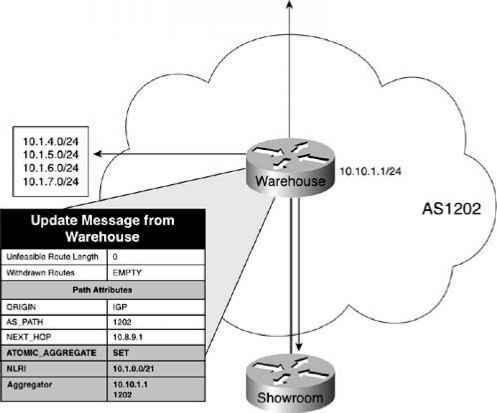 Figure 7-34 shows the AGGREGATOR in use for the route to the 10.1.0.0/21 network from Figure 7-33. In this example, the AGGREGATOR attribute was added to show that the router (BGP_ID 10.10 .1.1 i n AS 1202) aggregated tne route.